AlphaSunglasses offers a unique FREE unconditional sunglasses accidental damage repair cover for six months on all products sold through the site. Buy your new sunglasses in the knowledge that if you accidentally damage or break them within six months of purchase, we will repair them for you free of charge subject to the terms and conditions outlined below. The AlphaSunglasses guarantee is in addition to the standard manufacturer's warranty which already protects you against defects in materials or manufacture. AlphaOmega Glasses Frame Repairs will repair any make or model of glasses, spectacles or sunglasses frame including luxury brands such as Ray-Ban or Oakley using genuine original parts wherever possible and offereing a 12-month guarantee against faulty workmanship. You will need proof of the purchase of the sunglasses from the AlphaSunglasses website (your customer number and email address will do, and this must be the email you used when you purchased the sunglasses). The offer INCLUDES damage caused by accident, abuse, neglect, shock, improper use or storage and even damage caused by chemicals such as hair spray, cleaning fluids, etc. The offer ENDS six calendar months from the date of despatch of the sunglasses by AlphaSunglasses. The offer covers ONLY those glasses that AlphaOmega Frame Repairs deems to be repairable or in a fit condition to have repairs carried out. The offer is LIMITED to one pair of sunglasses per AlphaSunglasses customer within the specified six-month period. The offer includes replacement of scratched or damaged lenses with high-quality custom lenses (NOT branded designer lenses). New-for-old replacement of whole sunglasses (although it may include replacement of parts such as arms, bridges, nose-pads, etc. where AlphaOmega Frame Repairs deems the new parts to be required). 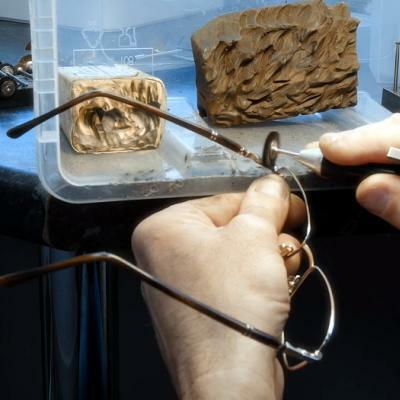 Sunglasses that have already been modified or repaired at any time by anyone other than AlphaOmega Frame Repairs. Damage to sunglasses already covered by an existing manufacturer's warranty against breakage due to defects in material and workmanship. Lost, stolen or missing sunglasses. Sunglasses deemed by AlphaOmega Frame Repairs to be beyond reasonable repair. Please note that the offer does not include the cost of free replacement of original designer lenses such as Ray-Ban or Oakley. An appropriate charge will be made for the purchase price of original designer lenses (although the lenses themselves will be fitted free of charge). Also note that AlphaSunglasses' FREE ACCIDENTAL DAMAGE COVER offer is in addition to, not a replacement of, the sale warranties provided by the manufacturer. For details of manufacturers' warranties please visit the appropriate website. For a free repair to your damaged AlphaSunglasses eyewear, you must contact specialist eyewear repair company AlphaOmega Frame Repairs through their website. The usual terms and conditions operated by AlphaOmega Frame Repairs will apply to any repairs they carry out. AlphaSunglasses' sister website AlphaOmega Frame Repairs offers an online sunglasses repair service for all brands of designer eyewear. Skilled technicians at AlphaOmega use the very latest high-tech equipment to repair and restore designer frames to the highest standards. AlphaOmega can carry our repairs on any make and model of sunglasses, from the most expensive designer brands to budget eyeglasses at very reasonable prices. Click here to see more of what AlphaOmega Frame Repairs can do to make your favourite sunglasses look as good as new, even if your optician has told you that your broken sunglasses are irreparable. AlphaOmega has testimonials from scores of satisfied customers from the UK, Europe, United States, Australia and more. The company prides itself on a fast turnaround with many repairs carries out on the same day that broken sunglasses arrive in the workshop. 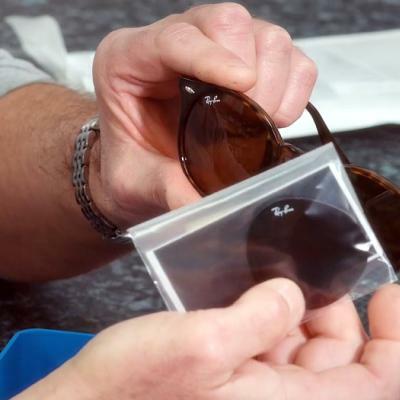 For top brand designer sunglasses such as Ray-Ban and Oakley, AlphaOmega can source genuine replacement parts. Genuine parts ae usually in stock or can be ordered direct from Italy in days. AlphaOmega glasses repair gives a FREE evaluation of the cost of repairs which can be as little as £10. Even major restoration work can cost a fraction of replacing expensive designer sunglasses while custom lenses can reduce repair costs even more. 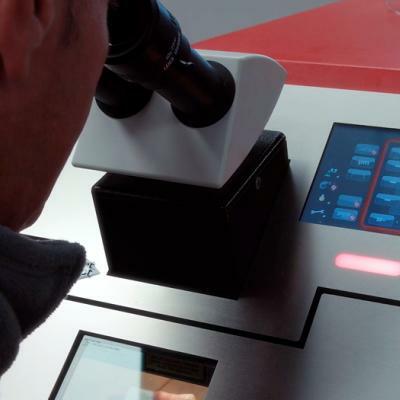 Customers get a unique tracking code so they can follow the progress of their glasses repair at any time and most jobs are carried out within one working day. 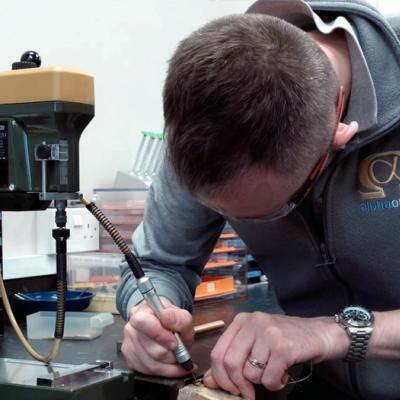 And AlphaOmega staff are so confident in their skills they offer a 12-month unconditional guarantee on any spectacles repair made in their workshop.